My, hasn't it been busy this past week? You would think we could've fit time in for these letters every day, but my, it's been crazy! I hope you don't mind a little delay in your turn for a message. I wanted to talk to you about your sweet nature, which is in concordance with several commandments. Today I read in Mosiah 18:9, and it reminds me of you. This is part of a beautiful story of a people living in exile, who wanted to draw closer to the Savior. They were worshiping in secret, because if the king of the land knew what they were doing, they would have been executed. 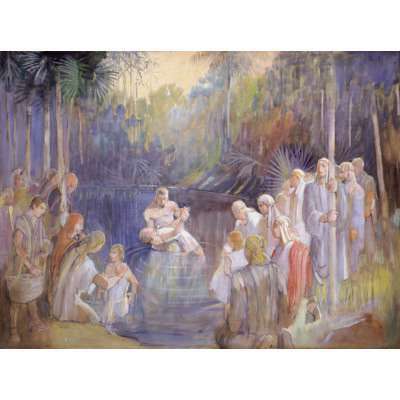 When they decided that part of Christ's gospel involved baptism, they willingly agreed to do so, and were (shortly after this verse) baptized by Alma, who had been given authority to do so. There is a pattern given later on about how that was done. What I love about this verse and you, is that here we learn that part of the commitment we make to God is to be willing to mourn with those that mourn, and comfort those that stand in need of comfort. To stand as a witness of God at all times, things, and places, even if it means ridicule, persecution, or ever death. If we do this, we may be "redeemed" of God, numbered with those of the first resurrection, and have eternal life. This isn't complicated, although sometimes it seems that way. In school, you have a very good friend that seems to get picked on. A way that you honor this part of God's wishes is that you stand up for him. You don't join in the teasing or bullying that he receives, and you are willing to stand up for him, even if it means other kids tease you too. It's not right to pick on others, and you inherently know that. I love that you care enough to do this for your friend. I would think this would be a common trait, but it's not always the way I think. I am thankful for your stalwart and fearless nature in this regard. I think sometimes you take after your mom, but have a bit less fear. You have also shown a willingness to stand up for God. Even when your friends use His name improperly, you likewise are willing to ask them to stop it. This is an easy commandment, but so many do not honor or respect it. I love that you do, and are sensitive to it. God will bless you for that.